We have lots going on for young people in our libraries and we have even have specially designed areas in many of them now where you can meet up with your friends. We have activities and events going on from Reaction & Tspace groups to the Catalyst book awards where you vote for your favourite author to win. 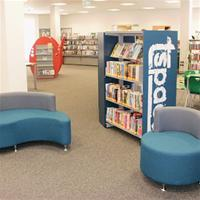 Libraries have worked with young people to develop Tspace, specially designed and branded spaces within many libraries where you can relax, chat with your friends, take part in events or just read a book. If you have a YoungScot card you can even get great discounts on the latest computer games so why not join the library to take advantage of the discounts. The YoungScot card even works as your library membership card so you don’t need to carry another card with you. A space for teens designed by teens. Tspace is a unique area in our libraries. It’s a space where you can come and relax, meet friends, do homework, read a book, listen to your MP3 or just plain chill. You told us that you wanted it to be more than just a space so we’ve also put in a few more things to make Tspace that bit more interesting. If you have an idea for a Tspace activity we’d love to hear from you. Who knows you might be helping to run a T-Space event in a library near you! Remember Tspace is for teens, designed by teens, so why not come and check it out?